Disclosure: I purchased this garment with my own money. All opinions are my own. When Meng first appeared on the lingerie scene, I was completely blown away. The prints were like nothing I’d seen before: lush, floral motifs so intricately detailed and with carefully considered placement. The robes and gowns were clearly at the top end of the lingerie market, with metres of flowing silk and expensive digital printing. Founded in 2012 by Meng Zhang (a designer who previously worked with Chanel and Lane Crawford), the label produces loungewear for men and women, homeware and accessories. Of course, custom printed, silk-heavy loungewear is never going to be cheap. And sadly, the brand’s (completely reasonable) price point remained firmly out of grasp for me, with slips starting at around £300 (approximately $400) and robes pushing over £1000 (approximately $1333). But my lingerie addiction knows no discouragement, and I waited patiently for something to show up on eBay. And show up it did! 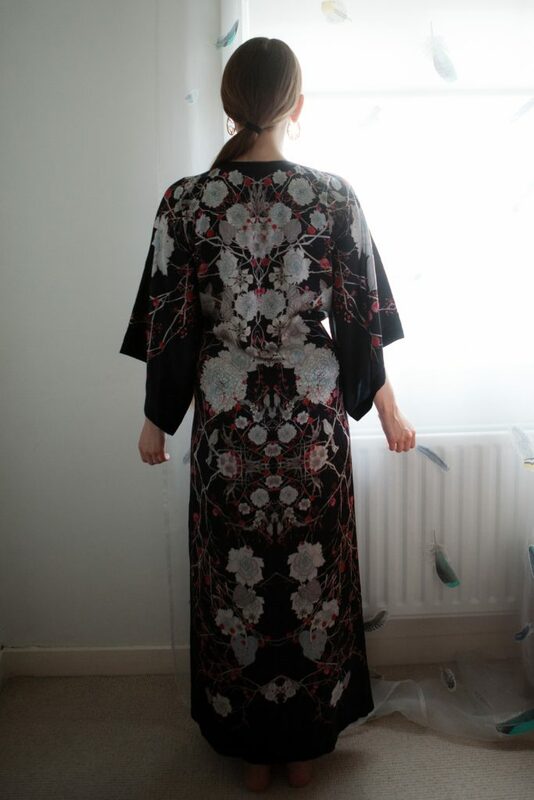 Within a month, I snapped up a kaftan, kimono and a slip for a tiny fraction of the brand’s full retail price. 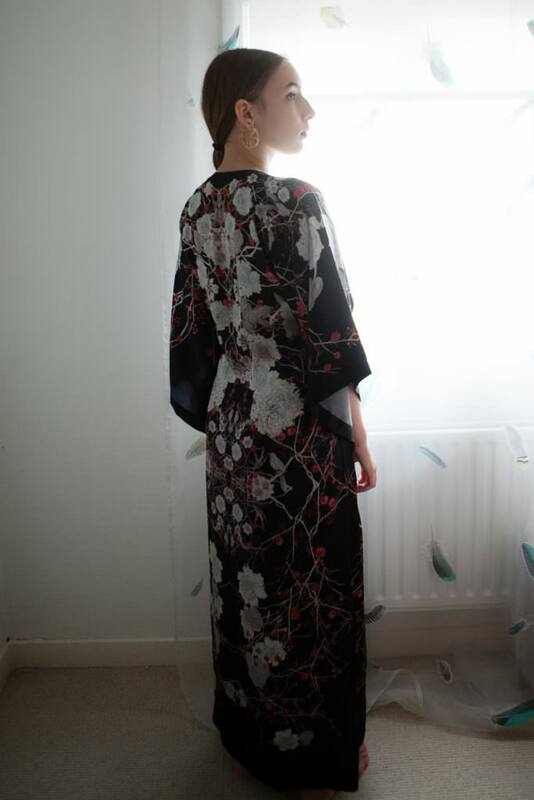 I purchased the ‘V Neck Pleated Front Kaftan’ in a cherry blossom print. It retails at £799 (approximately $1045) and is available in one size, recommended for a UK 8-14 (US 4-10). The kaftan I purchased came with its original shop tags and was unused and unworn, so I feel confident reviewing it as a new purchase. The print is even more beautiful in real life. In person, you can appreciate the intricacies and details that barely come across on a computer screen. The motif is incredibly striking and unusual: like a piece of art in its own right. 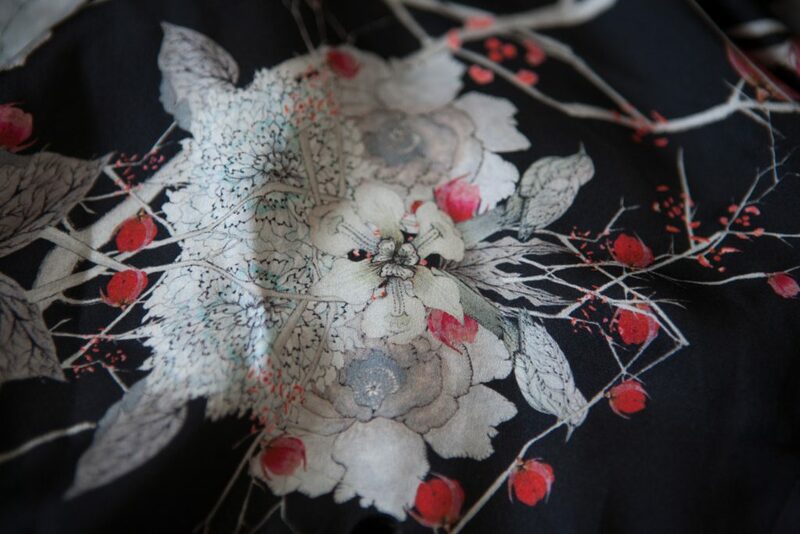 The print quality is also very good for a digitally printed silk satin and the design is clear and crisp. The motif of cherry blossoms is interspersed with blooming flowers and birds in a muted white/pale blue/red colour palette. The placement of the print when worn is carefully considered with symmetrical motifs across the entire body - even over the shoulders and sleeves! The silk is a good weight and is light and flowing without appearing sheer. 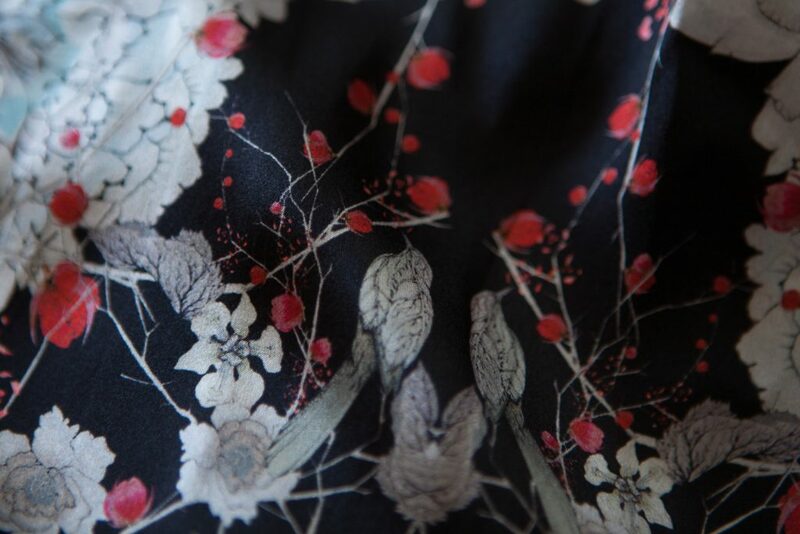 As it’s a digital print, the colours of the print have not penetrated to the inside of the silk, so the garment interior is a pale version of the exterior patterns and colours. The garment silhouette is loose and flowing with a relatively straight cut and can be cinched at the waist with a silk drawstring to suit different silhouettes. The kaftan is easy and comfortable to wear, and due to its loose fit, will work on a number of different body types. The suggested size range of UK 8-14 seems reasonable given the fit on my UK 10 body. The garment can definitely fit larger bodies well, and it wouldn’t completely overwhelm a smaller size either. 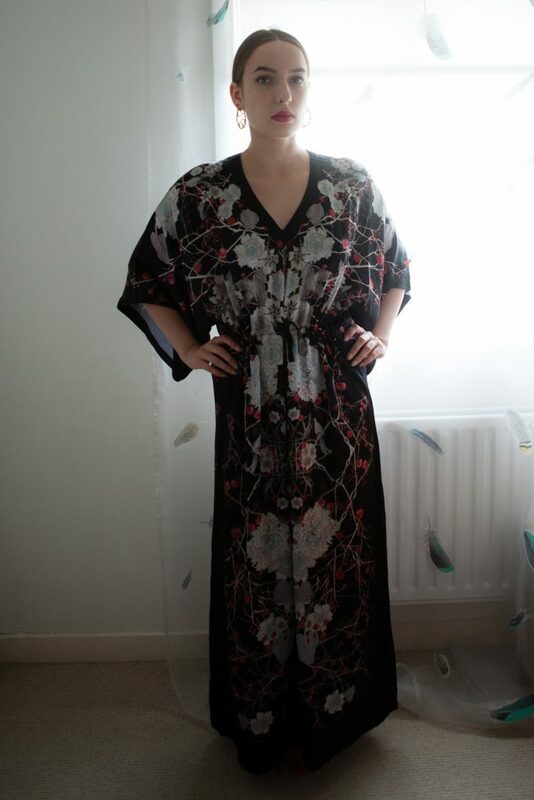 The kaftan is long, reaching below ankle on my 5’7” frame. Shorter individuals will find it pools on the floor. Fortunately, the last few inches of the garment hem are plain black, and can easily be shortened without interrupting the print. 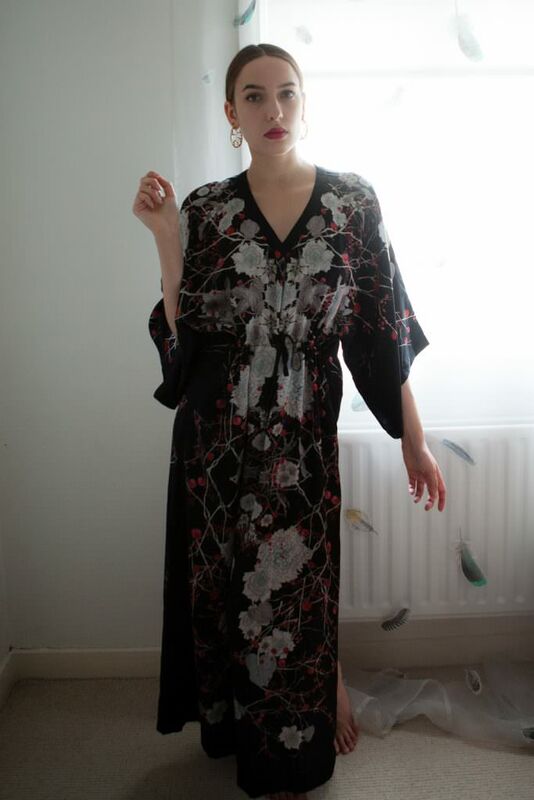 The Meng kaftan a comfortable and easy to wear garment, but still very elegant. It’s not sheer, so I suspect it would function as evening wear if styled right. I personally found myself wearing it as loungewear around the house as the sleeves are long enough to offer coverage without trailing into whatever I’m doing. Sadly, as beautiful as the design is, I feel let down by the quality of construction. 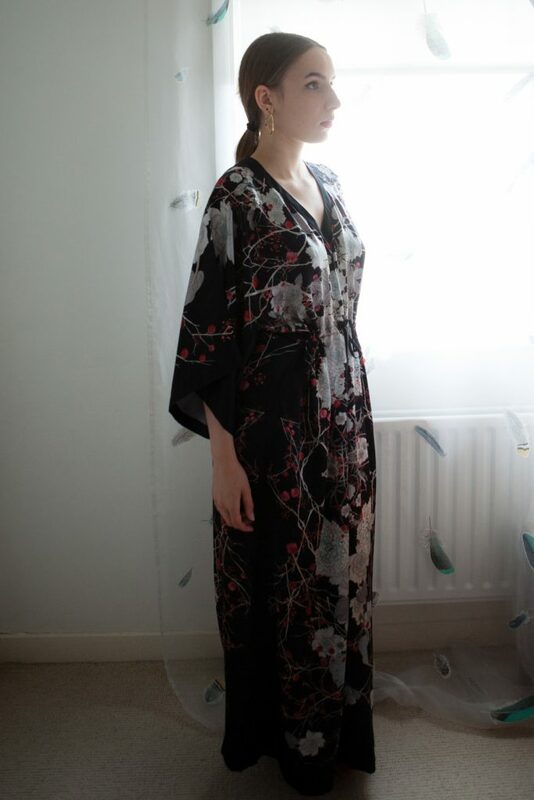 The kaftan is sewn in the UK, but does not have the quality of craftsmanship I’ve come to expect from other luxury European loungewear brands specialising in silk. 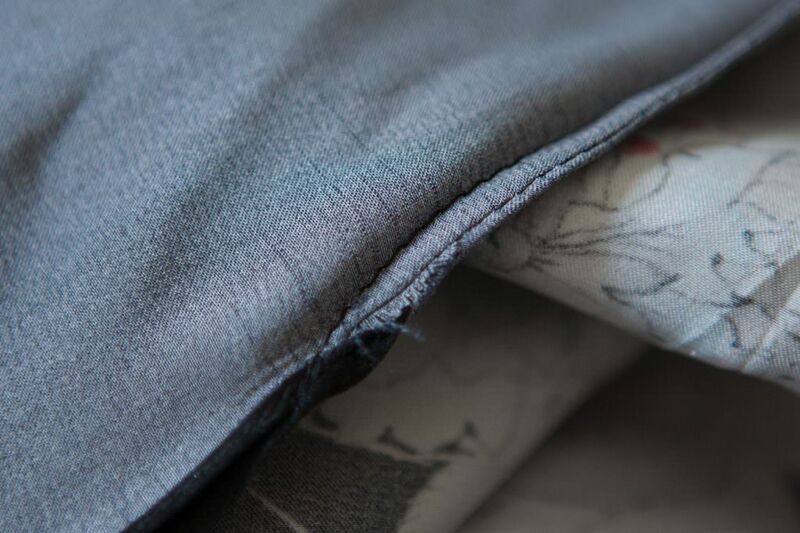 On the whole, the garment is well made and accurately sewn. It uses notable techniques, like the ditch-stitched neckline (a difficult technique where the stitching is sunk into the seam, so the exterior of the garment has a clean and stitchless appearance) and delicately rolled hems. The seams are all French seamed, as I would expect at this price point. However, there are a couple of areas where the seams aren’t neatly executed, and raw silk fibres are emerging. The drawstring at the waist isn’t as neatly sewn as I would hope: raw fibres are emerging from the button holes. The sewn channel for the drawstring uses long, mis-tensioned stitches, with messily double-backed stitching and loose threads. The hem of the garment isn’t finished as neatly as I’d expect either. 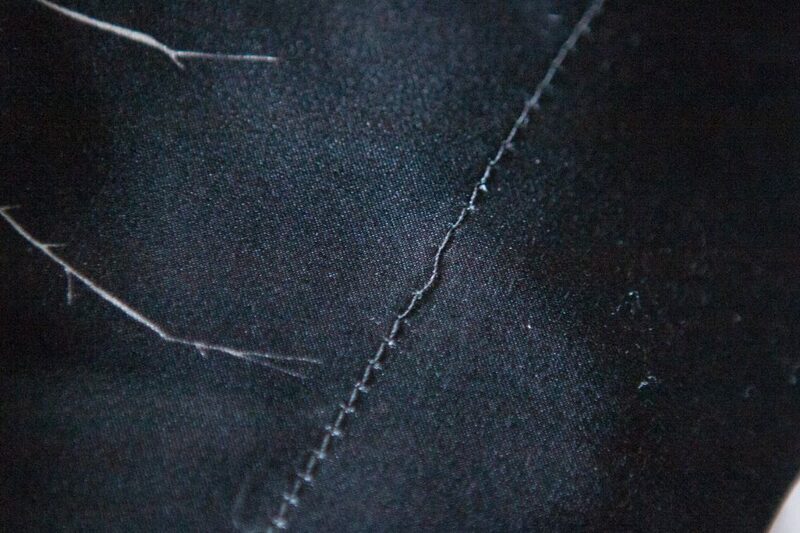 A blunted needle appears to have been used, which has the effect of catching and snagging the delicate silk fibres. There is a white mark around each stitch hole where the silk fibres have been separated. 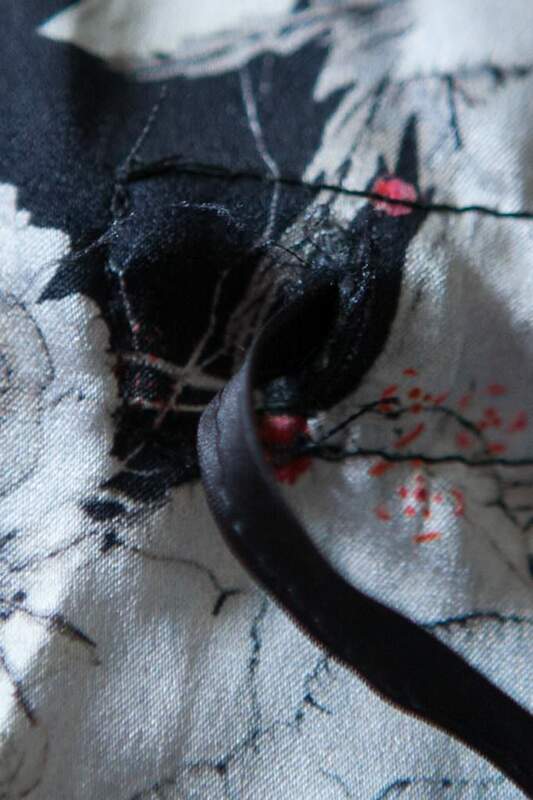 Because the silk is digitally printed, the pigment does not penetrate all the way through to the interior of the silk, as a dye would, so this flaw is extra visible. There are also a few areas where there are multiple skipped stitches, suggesting the sewing machines used need some maintenance. 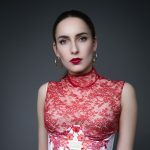 These flaws may not make much sense to someone who doesn’t make clothing, but to someone with a background in lingerie construction, they suggest there may be some quality control and sewing machine maintenance issues. I hoped this would be a one-off garment with a few flaws, but sadly the other pieces I purchased from this brand have similar errors. Nothing is so serious it makes the garment unwearable or affect its overall appearance, but they are all small areas of consideration that elevate a garment from ‘good’ to ‘luxury’. At these price points, I expect luxury. Meng's flaws aren’t something that will really affect the garment’s lifespan, but they have affected my appreciation for the label. I’m someone who values fabrics and construction techniques particularly highly in my lingerie purchases. But if you’re someone who goes for design, comfort and fit, none of the flaws I noted will affect your enjoyment of this brand. There's no argument the designs are still breathtakingly beautiful, regardless of how they're sewn. I know I’ll still enjoy Meng’s designs from a distance, and I expect to be routinely blown away by the beauty of the prints. However, it’s unlikely I’ll save up to purchase again anytime soon. I’m more likely to keep my limited lingerie budget aside for luxury loungewear designers like Carine Gilson and Rosamosario, with whom I’ve had overwhelmingly positive experiences. So you’re the one who snapped those pieces up, haha! I saw some Meng designs float through eBay a while back and I wondered who the lucky person was who’d bought them. Glad it was you so we all got a chance to see the print up close!